Cost to install a swimming pool enclosure varies greatly by region (and even by zip code). Get free estimates from swimming pool builders in your city. Cost to install a swimming pool enclosure varies greatly by region (and even by zip code). How much does it cost to install a swimming pool enclosure? A swimming pool enclosure is a structure, usually made from mostly transparent panels, that surrounds and covers your pool. Their look and structure is very similar to traditional sunrooms. They can turn an outdoor pool into an indoor or semi-indoor pool. 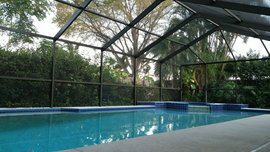 There are many benefits to installing a pool enclosure 1. They allow you to extend the swimming season since they can keep inside temperatures comfortable even when it’s slightly too cool for outdoor swimming. Depending on your local climate, an enclosure may enable you to enjoy your pool year-round. Pool enclosures 1 can also provide shade and sun protection, as well as protection from insects, leaves, and outdoor debris. Additionally, enclosures provide higher safety and security: unwanted people won’t be able to enter your pool, and you can prevent children and pets from wandering around the pool unsupervised. Prefabricated enclosure prices start at $15 per square foot. Custom swimming pool enclosures 1 generally cost $60-$95 per square foot, but there are many factors that influence the total cost. Swimming pool enclosures 1 can be built for both in-ground and above-ground pools. Above-ground pools are often equipped with temporary nylon dome-shaped enclosures that have zippered entry points. These start at $400. The size of your pool and the desired size of your enclosure strongly affects cost. Those of medium to high height (6’-10’) will allow for sitting and standing within the enclosure at ground level. The price of these generally starts at $40 per square foot. A 12’ x 24’ pool with a 3’ sidewalk will need an enclosure that covers 504 sq. ft. The total cost of this would be $21,600. The enclosures themselves have many different shapes you can choose: rectangles, domes, ellipses, and polygonal shapes. The shape you choose may affect how much standing space you have inside the enclosure at the pool’s edge. Domes can be angled, or completely round. Rectangular enclosures may have rounded tops, or be perfectly straight. There is a high amount of variation in enclosure shapes, with some even being asymmetrical. Some enclosures are also made to only cover the pool itself, only rising 1’ or 2’ above the surface. These are built on tracks for retractability. Low enclosures are the least expensive standard enclosure types, costing $20-$35 per square foot. Portable enclosures generally cost less than permanent enclosures, with some starting at just $400. These are usually made from lightweight materials like screens or nylon. “Lean-to” enclosures are made to be attached to an existing building, such as your house. These typically cost $80-$110 per square foot, or more. It’s worth noting that an enclosure can give you a 100% ROI when it comes time to sell your home. The best way to ensure the highest value increase is to build a permanent enclosure attached to your home (preferably with an entry/exit into the home). The structural beams of standard enclosures are usually made from high grade aluminum alloy. The transparent panels in between are often made from polycarbonate 2 (PC 2) or glass). Some pool enclosures 1 are made from screen panels instead. This type of enclosure ranges from $5 to $15 per square foot. Screen enclosures do not provide protection from weather, only debris and insects. This makes them good for seasonal enclosures only. They are unsuitable if you want a year-round enclosure. Professional swimming pool enclosure 1 installation services usually charge $30-$35 per hour for labor. It generally takes 10-15 working days to fully install a swimming pool enclosure 1 ($300-$525). This cost will likely be included in your enclosure’s price. If you’d like your enclosure to include a seating area or any other type of space, you will have to add that area’s square footage to the pool and pool perimeter, then use that total square footage to calculate your costs. It’s possible to add heating to pool enclosures 1. HVAC technicians usually charge $50-$70 per hour. The cost of extending your home’s heating system to reach an attached pool enclosure 1 starts at $520. Adding a dehumidifier to your enclosure starts at $2,000. Installed along tracks that allow the enclosure to be pulled back, opening up the pool area to the outdoors. Some enclosures can be fully retracted, while others only allow the roof or skylights to be pulled back, leaving the side walls up. Retractable enclosures are available in most price tiers and enclosure types. A pool house is an entirely separate building made to provide extra leisure space near your pool, as well as extra storage. The average cost to build a pool house is $125-$225 per sq. ft. In high-priced areas like San Francisco, the cost can be as high as $500 per sq. ft.
A small pool house of 300 sq. ft costs $37,500-$67,500 on average. A large pool house of 1,000 sq. ft. typically costs $125,000-$225,000. You can DIY your pool enclosure 1 by purchasing a kit. Most kits are screen enclosures, averaging $5 per square foot. There are standard aluminum enclosure kits with glass or PC panels as well, which cost $20 per square foot and above. Pool covers can keep your pool free of debris, and some security models also add safety. Average security covers cost $1,200-$3,000. Pool fences add safety, preventing children and pets from wandering by the pool unsupervised. They cost $1,120 on average. Your county, city, or state may require you to obtain a permit before building a swimming pool enclosure 1. Temporary enclosures are often exempt.Check with your local authorities for specific requirements and fees. Average permit fees are $80-$100. How much does it cost to install a swimming pool enclosure in my city? Cost to install a swimming pool enclosure varies greatly by region (and even by zip code). To get free estimates from local contractors, please indicate yours.